Pflugerville, Texas is a small city of about 50,000 people, near Austin. Officials there are currently negotiating with RRE Austin Solar, and Travis County to develop a solar powerplant that could generate enough power for every house in the city. The plant will likely be located on a 600 acre farm about fifteen miles away. It will house about $750,000 worth of solar panels. At the moment, Austin Solar (the company constructing the farm) is still waiting to hear about tax incentives they need to be able to go ahead with building the facility. Without tax breaks, they say they can’t afford to do the work. If all plans are approved, the Austin Solar would be obligated to finish construction by 2014. The plant would also have to be operational that year. One of the advantages of solar power plant construction is the relatively quick construction time. Building the plant will employ 200-300 people, but operating it will require only about five. And what are they waiting for...??? Kudos to Pflugerville, Texas!! 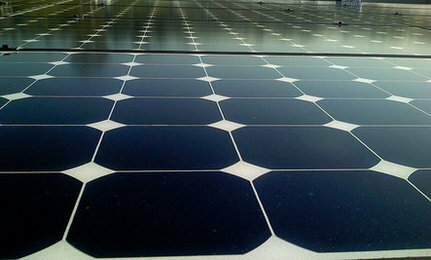 I must admit, I am amazed that a city in Texas is going the solar-powered route. I tink it is interesting that Texas, known for being Big Oil, is getting away from oil. Giant wind farms and going solar well ahead of some the more oil dependent State. Maybe, they can better afford going green with all that oil money. all of texas could probably be powered by solar if they tried. And this could become the model for similar small cities throughout the southwest and Texas. After that use the energy monitor to get a general idea about how much electricity you are using on a regular basis, and consult your electric bills. This will give you some idea about what you need as a minimum system for your home. You will notice power spikes when certain appliances are switched on (water heater, washer, dryer, etc), but youre looking for what the always on KwH is like. Shop around once you have that information. You will want a system that generates .5 to 1.0 KwH more than what you actually need, and you will also want to address what your nightly power consumption is by having enough stored battery power. Its $10K without installation, and batteries, but if I had this in place it would pay for itself in 3 years because I would not have an electric bill. PLEASE DO NOT FORGET: Whatever system you get, make sure you put a grounded lightning rod near your solar installation that is 4 feet taller than it. What I have described is for an off-grid solar system. Call your power company for details about on-grid solar systems if you are interested in being compensated for any excesses electricity. We should give all the middle/poor class people solar panels so they can charge electricity back to their local electric companies. Give them electric cars too so that they never have to pay for gas, and make sure those cars have solar panels on them so they are always charging. The financial offset alone would dramatically help our economy. Of course stupid people would rather you stay dependent on FILTHY energy sources like oil, and nuclear power. Solar power would upset the plans of stupid people to murder the middle/poor classes. Cheap solar depends on what you buy, and what you are willing to do to use it. They have private installation companies, and they even have one that's partnered with Lowes. Businesses/stores get a bulk solar discount which they (hopefully) pass on to you, but they tack on the price of labor. Doing it yourself saves you that cost, and it's really not that hard, but that does mean you have to do it yourself, and depending on your level of skill that can be worse than the extra cost. Find your ac/heat leaks, and seal them up. Then change out all your light bulbs inside/outside your house with LEDs. Preferably 1 watt, and white, but you can usually get better discounts with non-white colors. You can double up in areas that need more light.